Despite the growing popularity of crypto-currencies like Monero and Ethereum, bitcoin is still by far the most popular digital currency in existance. This is party due to how easy it has become to buy bitcoin at ATM's and on exchanges using your credit card. Bitcoin is also the crypto of choice at most online poker rooms like Americas Cardroom, BetOnline and Black Chip. Unfortunately, most bitcoin poker sites do not yet support mobile poker on Android, iPad, iPhone and Windows Phone. There are a couple of exceptions, however, which we list below. These bitcoin poker apps allow you to play a range of cash games, including Omaha and Hold'em. Sit & Go tournaments are on offer and wide variety of different types of bitcoin poker tournaments. All of our recommended bitcoin friendly mobile poker sites welcome players from the United States of America. Start playing anonymous BTC poker on your phone or tablet today. Nitrogen Sports is the leading mobile sportsbook for bitcoin betting. They are also the only bitcoin-exclusive poker site that is fully compatible with Apple iOS, Google Android and Windows Phone devices. Real-money players from the United States are welcome. Start playing bitcoin poker on any phone or tablet instantly without having to download. Play bitcoin Texas Hold'em, Crazy Hold'em and Omaha games on the move. No-Limit and Pot Limit Sit & Go's and a variety of tournaments, including hourly freerolls. Low stakes games start at 0.01/0.02 mBTC and go up to 500/1000mBTC for high-stakes. Both deposits and withdrawals are processed within minutes and there are zero fees. You can create your poker account instantly without having to provide any personal info. Bovada were one of the biggest poker rooms for United States real-money players until they decided to remove poker from their website for legal reasons. The Bovada poker player base moved over to a brand new site called Ignition Casino that offered the same service. Ignition Casino is a poker room that is strictly for United States poker players. You can play from your PC/Mac or from any Windows Phone, iOS or Android device. Ignition accepts bitcoin and also major credit cards, bank transfers and other options. Player accounts are not anonymous. You will be required to provide ID for withdrawals. 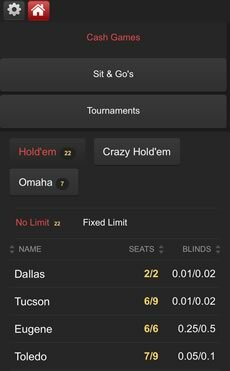 Tournaments are not available but you can play Hold'em/Omaha and turbo poker. BTC payouts take about 1 - 3 days. There are zero fees when you use bitcoin at cashier. ​Online poker has been popular for as long as the Internet had the capability to bring users together to play it, and now bitcoin is becoming a popular way for players to fund their games. With fewer regulations than government-backed currency, bitcoin allows mobile poker players the ability to fund their accounts and play with far fewer questions than they would receive from banks or other formal financial institutions. Now, with the funding method gaining popularity, major players in the online poker world are incorporating bitcoin mobile poker into their offerings. In the past, playing poker using bitcoin required players to sign up for a site such as Seals With Clubs, which offered only bitcoin poker, and didn't necessarily feature the same quality visual presentation or user experience that major poker sites do. Perhaps worse than any bitcoin poker site's visual offerings, though, was the lack of choice for players, who simply didn't have the options they have now. Today, poker-specific sites as well as sportsbooks that offer poker are in on the bitcoin act, allowing their players an endless array of options when it comes to bitcoin mobile poker. Currently, big name poker sites that offer bitcoin poker action include America's Cardroom, PartyPoker, PokerStars, and more. The benefit to using sites like these is that poker is their specialty, and they have strong reputations as far as that game is concerned, along with visual interfaces that are both easy to use and visually appealing, while serving the needs of both novice and experienced players. In addition to poker-specific sites offering bitcoin transactions, sportsbooks are doing the same. BetOnline and Nitrogen Sports are among the places that offer both bitcoin poker and sports betting, which offers flexibility in the types of action you can enjoy. Unlike a poker site where you can only play card games, these sites allow players to switch between poker and sports betting, reducing the number of sites you need to keep an account with to get different types of action in. Speaking of flexibility, the ability to play online poker on mobile devices is important for players who want to be able to get into a game no matter where they are. 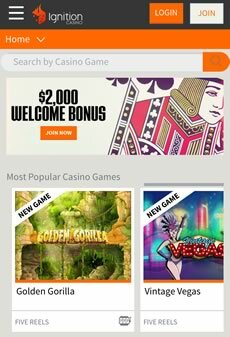 Fortunately for these players, sites like Nitrogen Sports and Ignition Casino are around to allow players to play bitcoin mobile poker no matter where they are and no matter what else is going on around them. As with bitcoin sports betting and other forms of online betting with bitcoin, a huge benefit to playing your poker using bitcoin is the potential for fewer fees associated with depositing and withdrawing funds. Nitrogen Sports, for example, does not take fees from its players, which is a huge boost for players looking to build their bankroll, as that bankroll isn't cut into by the service before the first hand is dealt, as is the case with many other online poker services. Of course, it is important to remember that certain online poker services impose restrictions on their players based on location, so even if you want to play poker using bitcoin, you may not be able to depending on where you live. This is an issue in the United States, where prominent poker sites such as PokerStars do not allow players to play in tournaments for real money due to legislation that has banned them from doing so. Sites such as Nitrogen Sports, however, offer no such issues and are a great way for players to enjoy bitcoin mobile poker without geography-based restrictions or other points of frustration that more traditional online poker sites can cause their players.